Trimming your cat’s claws could be more than just tolerable. With the right tools, it might even be fun. With the right training, preparation, and a great pair of nail clippers, you can transform your cat’s nail trimming experience from struggle to spa day. What should you look for in cat nail clippers? The best cat nail clippers are strong, sharp, easy to maneuver, and cleanly trim your cat’s claws without damaging them. In this article, you’ll become familiar with the different types of nail clippers and their merits, find out what to look for in a pair of clippers for your cat, and finally, you’ll meet my picks for the top 5 best cat nail clippers on the market today. Choose clippers with ultra-sharp blades. Choosing the best cat nail clipper is like picking a good shaving razor. 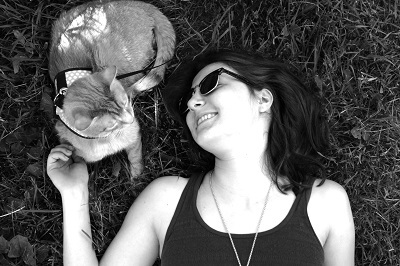 Low-quality, dull blades are seductively easy on the wallet, but they put you and your cat at risk for injury. Strong, sharp blades glide through your cat’s claws without crushing them. Choose a high-quality stainless steel blade and your clippers could serve for a lifetime of snipping without going dull. The best cat nail clippers are as comfortable on your hands as they are on your cat’s nails. Remember that cats are wriggly creatures and you’re not necessarily a grooming expert. A slippery grip and a slippery cat could lead to a bloody manicure. A sudden movement could send the blades into the sensitive quick of your cat’s nail. We’re looking for a design that fits well in the hand, has a perfect weight balance, and which features a comfortable non-slip grip. All of these features help you to maintain control. Look for safety features that protect both you and your cat. When you’re trimming your cat’s nails, there’s one thing you’re probably going to worry about more than anything else. You’re going to constantly work to avoid accidentally cutting into the quick. Choosing a pair of nail clippers outfitted with one of these guides will help you to avoid snipping into the sensitive heart of your cat’s nail. Protect yourself and your family by selecting clippers with locking blades. These help to prevent accidents when the clippers aren’t in use. Need another way to keep your cat’s claws under control? Here’s our list of the top 10 best cat nail caps. This style involves a small pair of scissors with rounded tips — similar to baby fingernail scissors. But unlike a standard pair of scissors, nail scissors for cats feature notches that hold your cat’s claw in place while you snip. Scissor-style clippers are a great choice for beginners and experienced clippers alike, but they might not be a good fit if you have large hands. The handles, while comfortable for small hands, are usually a poor choice for anyone with more generously-sized fingers. If your hands are on the large side, resign yourself to a few minutes of cramped hands or think about choosing a pliers-style nail clipper instead. Perhaps the most highly acclaimed variety of cat nail clippers, this style is popular among both beginners and professionals. 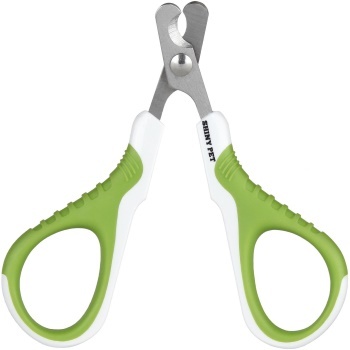 As the name suggests, they’re shaped like a pliers, with long, comfortable handles that fit in any hand. 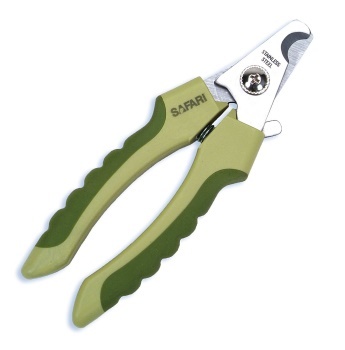 The design gives you good leverage and strength, allowing you to make quick, effective snips. This style features a loop through which your cat’s claw passes. When you squeeze the handles, a blade moves through the loop and chops off the tip of your cat’s nail. For the most experienced groomers, guillotine-style clippers have some precision appeal. They make it easy to choose exactly how much of your cat’s nail you want to cut and at which angle you want to slice. But it’s not all sunny. If you’re inexperienced or if your cat tends to wriggle during a trimming session, a guillotine style clipper tends to obscure the place where the safe zone ends and the quick begins. Cats are sensitive creatures and, unless yours is an extremely chilled-out anomaly, they won’t be happy about a noisy electrical appliance whirring around their nails. These speedy grinders are a good choice for dogs, but a frightening proposition for the average cat. Can you use human nail clippers for your cat? A good pair of human nail clippers will out-trim a cheaply-made trimmer for cats. Human nail trimmers are usually small and maneuverable and, if the blades are sharp, they can give a clean cut. But they’re not perfect. They don’t grab the claw in the same way that the best clippers do, making your job more difficult and potentially crushing the claw. All of these tools are well-made and well-loved by customers and cats. Each has a reputation for durability, effectiveness, and comfort. 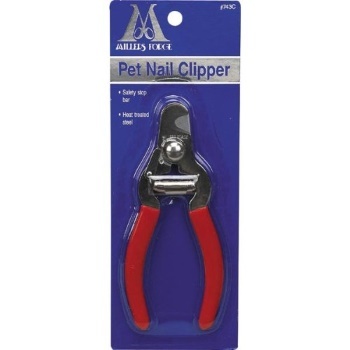 When a journalist writing for Wirecutter asked groomers to name the best dog nail clippers, experts unanimously agreed that Millers Forge clippers lead the pack. But do Millers Forge clippers work well for cats? While this clipper has its fussy moments—customer reviews say that the rubber grips tend to slide off and that the safety guard slips out of place—it offers a quick, smooth, and silent trim. This pliers-style clipper features heat-treated steel blades. Customers describe the blades as exceptionally sharp and durable. One customer said that they successfully used one pair for over 10 years. The blades are thin, providing a good view of your cat’s nail. The spring-loaded clipper allows you to move smoothly from claw to claw. This pliers-style nail clipper has almost everything you would want in a pair of cat nail clippers. Maybe that’s why it’s such a customer favorite. This nail clipper currently has 5,480 customer reviews on Amazon and a 4.6 out of 5 star rating. This nail clipper has strong, ergonomically-designed handles that feel comfortable in most hands. They feature non-slip grips that allow you to cut your cat’s nails with confidence. The ultra-sharp stainless steel blades have a reputation for durability. They come out of the package sharp and stay keen for years of trimming. With each snip, the spring-loaded jaws pop apart, allowing you to move easily from nail to nail. Cautious nail trimmers will appreciate the inclusion of a safety stop to help you prevent slip-ups when your cat makes a sudden movement. These scissor-style clippers were made with small animals in mind. In addition to cats, they’re recommended for small dogs, rabbits, birds, puppies, and ferrets. 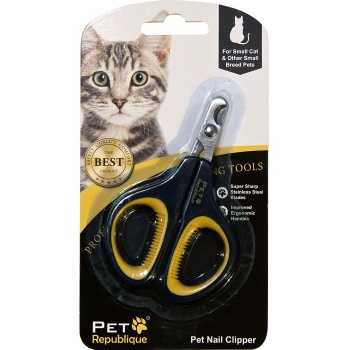 The angled clipper head features an opened window that allows you to keep an eye on your cat’s nail as you snip. Because the blades are razor-sharp, these scissors allow you to make quick, clean cuts. The anti-slip grip handles give you precision, comfort, and confidence. Each pair of Shiny Pet clippers comes with an instructional eBook called Trimming Your Pet’s Nails. Like the Shiny Pet clippers, these are small nail scissors designed for tiny claws. The cat/mini clipper size is perfect for your cat’s delicate nails. The scissors are simply-designed, with stainless steel blades that lock when not in use. To help you avoid the quick, the blades are outfitted with a safety guard. While the finger holes might cramp larger hands, you’ll find that the ridged rubber handle loops offer a non-slip grip for comfort and accuracy. 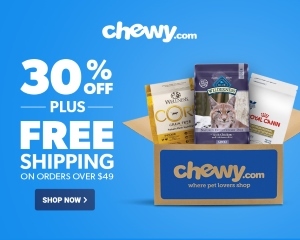 If you’re a philanthropically-minded shopper, you’ll be interested in Pet Republique’s partnership with the American Animal Rescue Society. 15% of the profits are donated to this organization. This pliers-style nail clipper offers comfort and ease of use for groomers of all sizes. The extra-long handles have a vibrant magenta color with black non-slip handle grips. 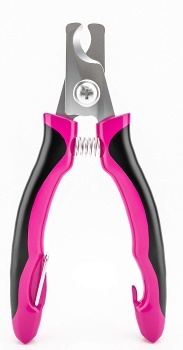 To keep you safe while the clippers aren’t in use, the handles feature a convenient loop lock. The clippers have a 4.3 out of 5 star rating based on 123 reviews on Amazon. Reviews of the stainless steel blades are varied. Some people say that they’re sharp and effective, while one top-ranked review states that the clipper cracked their cats nail. Another drawback is the clippers’ lack of a safety guard. This makes them a poor choice for inexperienced groomers.